These low-carb and gluten-free turkey meatballs are flavorful and have added nutrition from hemp hearts. 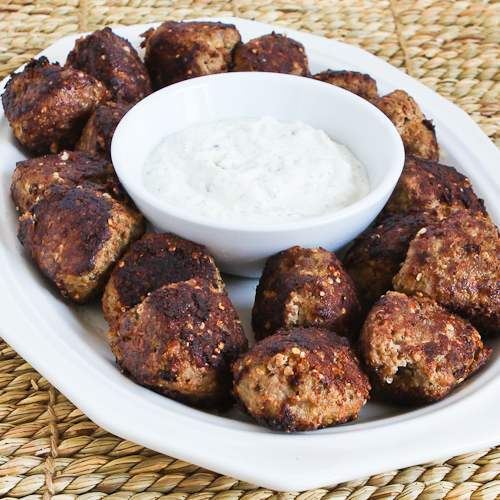 When I first tried these meatballs back in 2009, ground turkey was something I'd been working hard to gain an appreciation for, since it's low in saturated fat (therefore South Beach Diet friendly.) Now I've been using ground turkey in meatballs and meatloaf for quite a few years, and these meatballs with lots of ground herbs and Romano cheese are still one of my favorites. In this updated version I added a small amount of hemp hearts to the recipe to bump up the nutrition, but that's completely optional. The meatballs are a little soft to work with, and you do have to watch them so the cheese doesn't burn when you're frying them, but if you want a flavorful meatball that's Phase One, low-carb, and gluten-free, I think this recipe is a keeper!